Cancer survival estimates for 67 countries have recently been published for 10 cancer sites, in an exhaustive and thorough combined analysis (CONCORD-2). Never before has such a comparable set of survival estimates been available. And New Zealand does okay – not top of the list, but okay. We are usually worse than the country we love (or hate?) to compare ourselves with, Australia. Conversely, we are usually better than the UK – a wealthier country with presumably more healthcare resources at its disposable. This global study puts in context recent specific New Zealand-Australian comparisons – yes, New Zealand could do better but neither is it doing too badly. The Concord study (1) gives five year relative survival estimates for 11 cancers, for three periods in time, for 67 countries. The study was designed to address potential criticisms of such a large international cancer survival comparison study by using the same data collection methods for each country and by also collecting information about the underlying life expectancy that will impact survival in each country. 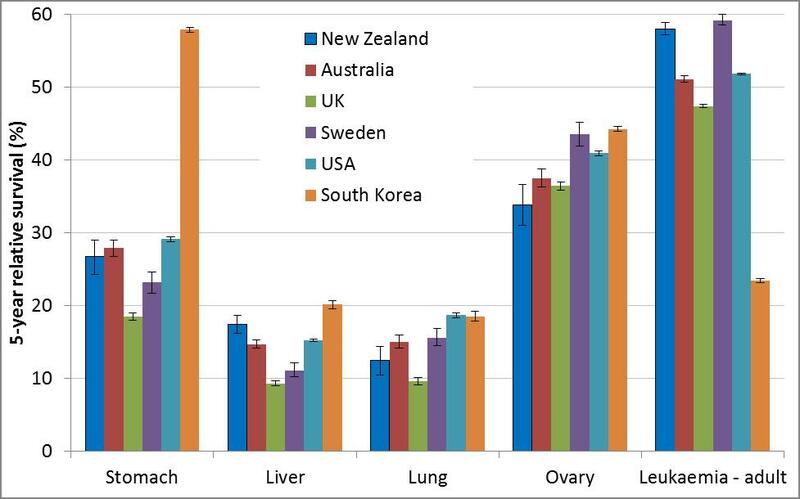 The two figures below presents 2005-09 survival estimates for low and high survival cancers, for selected countries: New Zealand; Australia; UK; Sweden; USA; and South Korea (same GDP per capita as New Zealand). The first thing that stands out is that survival in the UK is often lowest – an embarrassing statistic from the UK’s perspective that galvanised the implementation of a well-fund cancer control strategy a decade ago, which appears not to have resulted in a major improvement by 2005-09 at least. Second, Australia does a bit better than New Zealand for most cancers – but not adult leukaemia. Likewise Sweden and the USA. Third, it may be surprising how well South Korea is doing. This is particularly so for stomach cancer. Stomach cancer is considerably more common in Asia than New Zealand (although rates are high among Māori), and consequently there is vigorous early detection and treatment in Asia. 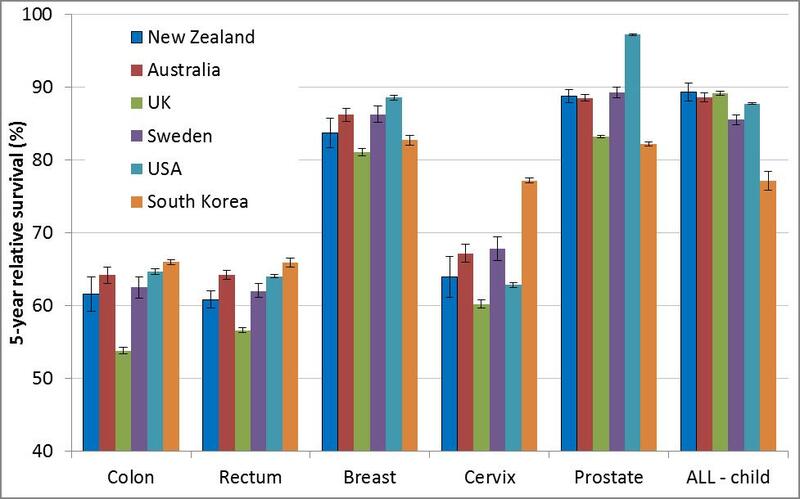 There may also be some differences in type of stomach cancer compared with New Zealand. 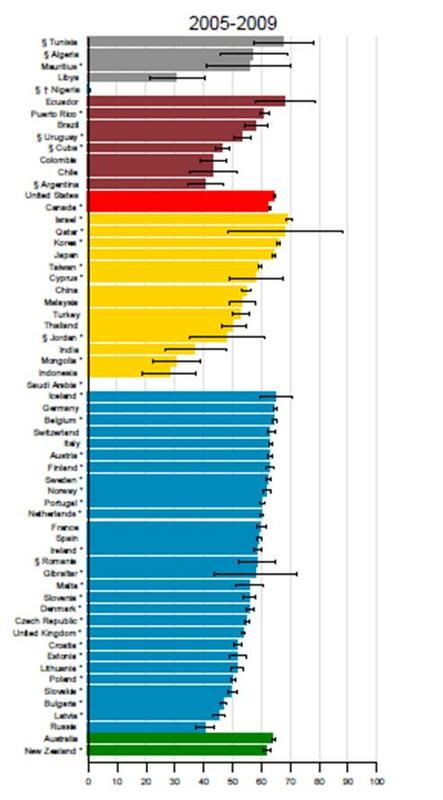 Massive differences in survival across all countries (our selected countries above are more similar; and see figure below for global differences in colon cancer survival), including for treatable cancers such as both adult and childhood leukaemia. Modest to moderate improvements in survival over the 15 years of the study. What do these cross-national comparisons tell us? Survival is a function of how early the cancer is detected, and how well it is treated, which in turn is a function of how societies configure, implement and fund their health and cancer services. The variation in survival between countries, assuming biology is similar, points to potential gains that lower performing countries could extract. However, not all differences in survival reflect improvements in outcomes for patients. Keeping in mind that survival time is taken from date of diagnosis, if a cancer is detected earlier but the outcome is unchanged, the survival time will appear to be longer. For example, widespread uptake of PSA screening for prostate cancer is likely to be the cause of the apparent rapid improvements in survival time for this cancer in many countries which considerably outstrips any improvement in the number of men actually dying from prostate cancer. In addition, while substantial effort was put into ensuring quality data from all included countries, there are still likely to be differences in the data quality which may also impact on survival estimates between countries. Thus, New Zealand could do better. Aye and colleagues (2) recently dug deeper on the New Zealand-Australia comparison, finding a 4.2 percentage point lower 5-year survival across all cancers combined. Interestingly, this gap in survival was usually achieved after just one-year post-diagnosis, pointing to the trans-Tasman differences being due to early diagnosis and/or early treatment. Cancer survival is improving over time for most cancers in almost all countries. So the game for each country is to increase their survival estimates as fast as possible, if this can be done cost-effectively (i.e., it could be more cost-effective to further lower cardiovascular disease instead). However, an optimal national approach to cancer control requires a clear overarching strategy that encompasses the entire spectrum from preventing cancer through to ensuring high quality palliative care services. In New Zealand, our existing cancer strategy requires updating. In terms of cancer survival, policy action is focused on patient management pathways incremental increases in access to treatment, the development of tumour standards which provide an indication of the minimum standard of care that should be expected for particular cancers and a focus on ‘faster cancer treatment’. It remains to be seen if these efforts will result in a reduction in the impact from cancer in NZ.